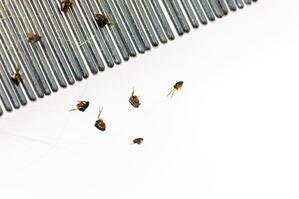 Our flea treatment and flea control services allow you to make your home safe from these and other pests. With our safe, eco-friendly formula we can eliminate your flea problem today. Pet stores and veterinarian offices aren’t the only places that get infested with fleas! It only takes the presence of a pet in your home or office to invite them in. Even though the pet may only be inside for a little while, what they left behind may be around a long time! Fleas are common in homes that have pets, especially dogs and cats, feeding on the blood of animals and humans. Their bites leave a red itchy mark by don’t swell like mosquito bites or bee stings. These bites are a sure sign of these pests in your home. Our treatment service allows you to make your home safe from these annoying pests. It is important to note that infestation does not only effect pets in your home, but you and your family too. That’s why it is important to call a specialist to identify the hotspots and free your home of the infestation. Remove pets before the treatment starts in your home. Sweep and vacuum your home before the treatment; they love to hide under the carpets, furniture, and bedding. Clear all items including dishes and toys, furniture, and bedding; don’t leave anything for the them to hold on to. Mow your lawn before the treatment so they get no chance to hide in the grass or leaves when the treatment is done outdoors. Dispose of items that are heavily infested. Since the main source of inviting them into your home is your pets, make sure to inform the pest exterminator about the area where your pet sleeps, eats, plays and moves around. All these measures are necessary to make sure your treatment is successful. To ensure that your home is permanently free of flees, make certain to regularly clean your home. Mop and vacuum the floors and clean your pet’s sleeping area, bed, toys and food trays often. If you spot fleas or their eggs in your home, call us to inspect your home. We will come in for an inspection and recommend the best possible ways to protect your home. There are a number of ways to tell if you’re dealing with a flea infestation. First, you might notice your pets scratching or chewing on themselves excessively. This is particularly common in dogs, and even just a handful of fleas can lead to compulsive scratching in dogs with a flea allergy. Additionally, you’ll often find small, red, itchy bite marks on your extremities, particularly around your ankles and lower legs. Finally, you can often detect fleas themselves with the naked eye. Fleas are fairly easy to spot when fully grown. How did I end up with a flea infestation? While there are a number of ways that fleas can be introduced into your home, one of the most common is through a domestic animal such as a dog or cat. While spending time outdoors, cats and dogs will often pick up fleas and then carry them inside. Once indoors, fleas will begin to reproduce and can quickly increase in number. First, you’ll have to thoroughly vacuum your entire home, including all upholstered surfaces. You’ll then need to mop all of the tiled, laminate, and hardwood floors in your home. Next, you’ll apply a flea treatment. Once the flea treatment has been applied, you’ll have to vacuum your home once per day for the next few days. Your vacuum’s contents should be disposed of some distance from your home, and you’ll be vacuuming up live fleas and eggs in some cases. You’ll also need to bathe your pets to eliminate any fleas they may be carrying. Check out our Pest Control Resource Library for answers to frequently asked questions, our pest identification tool and helpful pest prevention tips. Consider this your one-stop shop for all pest control resources. We’re locally owned and operated and have been offering pest control solutions for the South Carolina area for over 55 years. We are the first defense against pests for your home in the Coastal, Midlands and Upstate regions and surrounding areas in South Carolina. Our competitive pricing is just one of the many reasons we are the smartest choice for pest protection.